When you are a DIY junkie, you DIY all the things-- Including hair. I have an aunt that I adore that once told me that she cuts her own hair. On haircut days, she would wear a striped shirt and use the stripes as a guide. I've never loved her more! I know I'm 34 and should act like a grown up and quit bleaching my hair, but I can't quit my blonde. After paying lots of money at salons to try to get Icy Blonde, I've tried a ton of things and now I do it on my own. My natural hair is very light so it makes it much easier to achieve this kind of lift. (I am NOT a hairdresser. Hairdressers have access to these products and I am almost positive they would use them if you asked. 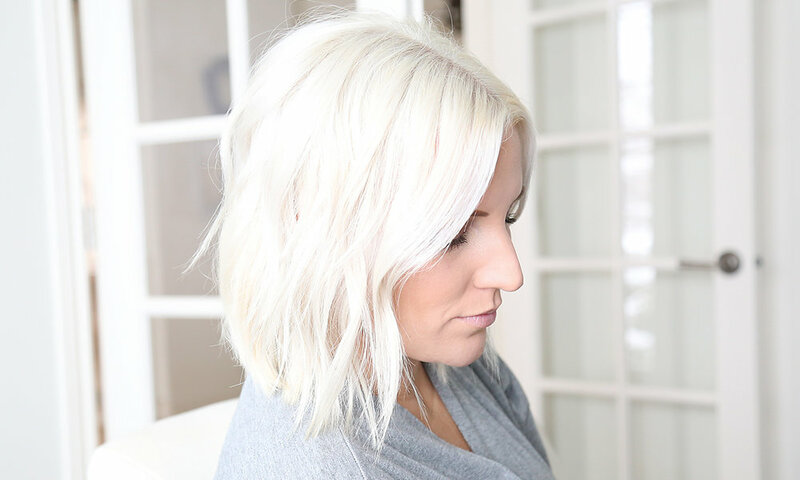 If you are hesitant or have dark roots, let a pro handle the bleaching and the maintenance will go a long way.) So for what it's worth--here are the best things I have found to keep kick the brass to the curb. Really good bleach is important. I have used Wella and Redken but this one is my favorite. It has bonding technology so no need for any additives. It lifts quickly and keeps the hair in good shape. You will need to mix the bleach with a developer. I use 40 Vol in the same line as the bleach. 30 Vol would also work, but this one gives me a quicker lift. Follow the directions on label and mix it with any 20 Vol. developer. I leave it on my roots for 10 minutes, then pull it down the the ends for 10 more. This giant bottle will last forever. It seems to be gentle, has a pleasant smell and gets the job done. There is no way around it, bleaching will always cause a bit of damage. This stuff will help restore the pH balance and make your hair noticeably softer and stronger. I use it once a week on damp hair. I put in on at night and sleep with it on before washing the next day. I'm a believer. I try to only wash my hair every 4 or 5 days (curse cooking bacon and sitting by the fire---they are the only things that can make me wash it more often). When I wash it, I LOVE this set. Super mousurizing without being heavy, my hair loves it. After I wash my hair (or anytime it's wet), I give it a good spray with this leave-in conditioner. It isn't heavy at all, it smells great and it gets rid of any tangles to make brushing through wet hair a breeze. I use this on my daughters long hair too---it really is a 10! I have fine hair that wants to lay flat no matter what I do. This spray adds texture without adding weight and lasts all day. I may not be an expert, but I have years of practice with this color and these are my go-to products. I hope it's helpful in your quest for Icy Blonde. Again, if you are hesitant, definitely leave step 1 to the pros. The rest of the steps are simple and fail-proof. Products are linked again below. Let me know if you have questions in the comments below. Cheers, blondies!